High Pressure Hoses - What you need to know. Because hoses look deceptively simple and can withstand all sorts of inappropriate treatment, hoses are the most abused pieces of equipment in the pressure washer industry. Hose care and maintenance is not only essential for full service life, it is necessary to ensure the safety of the operator. A hose blow-out will cause water under very high pressure, and in many cases under high temperatures, to jet out causing serious injury to the operator and bystanders. Understanding how a hose is constructed will arm you with the information you need to know on how to care for your hose and, most importantly, when to replace it. Pressure washer hoses are made of three layers: The innermost layer, the middle layer and the outer layer. The innermost Layer is the part that is exposed to cleaning solvent or water, and it is usually constructed of an oil-resistant synthetic rubber, such as neoprene or nitrile blend. These materials can withstand exposure to a variety of solvents and high temperatures (-40°F to 250°F) and are thus well-suited for their application. The middle layer contains the hose reinforcement. This may consist of 1- or 2- wire braid, usually constructed of high tensile steel, or 1 or 2 braids of high strength yarn. The wire reinforcement is possibly the most important part of any hose, for it keeps the hose in one piece while it is being subjected to high pressures. It is not surprising that many causes of hose blow-out can be traced to a break in the wire reinforcement. The third layer of the hose is the hose cover. Like the inner tube of the hose, the hose cover is also constructed of durable material, usually carboxylated nitrile. This is usually pin-pricked to allow super heated water permeating the tube to escape, thereby preventing blisters from forming on the cover. Further hose specifications include abrasion, oil and fat resistance. Suitable material may also be incorporated over the inner tube and/or over the wire reinforcement to anchor the synthetic rubber to the wire. Hose fittings are either the European ball-type quick disconnect or the threaded type. The former is more convenient (and subsequently more expensive), but is more prone to developing leaks because of the greater number of valves it contains. The threaded fitting, although more time-consuming to connect, is cheaper, more fail-safe,and less prone to leaking. Hose failures usually occur within 3 to 4 feet of the gun or wand end of the hose. Needless to say this is an uncomfortably close distance to the operator. However, most of the problems that lead to a blowout can be avoided. The biggest cause of hose blowouts is abuse. Therefore, certain steps can be followed for proper hose care and maintenance to avoid many of the problems that lead to blowouts. 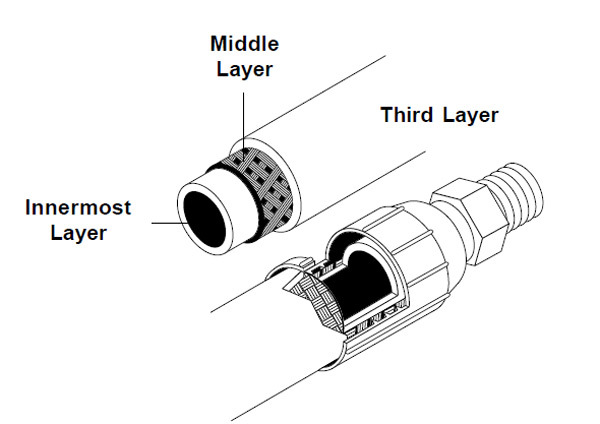 One reason many hose blowouts occur so close to the wand end is improper coupling of the connector to the hose. Consequently, one of the main safeguards which can be followed when operating a hose is to make sure the fitting with the spray gun has been properly executed and that the crimp setting for the hose has been accurately determined. Excessive kinking of the hose can cause damage to the wire reinforcement, thereby weakening the hose and making it more susceptible to failure and blowout. Excessive kinking often occurs when an operator treats the hose like a rope and uses it to pull the pressure washer along during cleaning operations. This puts excessive strain on the connection at the pump and can also cause an unreasonable amount of kinking when, for example, the operator uses the hose to pull the pressure washer around corners. High quality hoses with bend restrictors and live swivels can prevent excessive kinking due to manipulation of the spray gun. Driving over a high-pressure hose seems to happen a lot, and unfortunately, these hoses were not made for this kind of abuse. 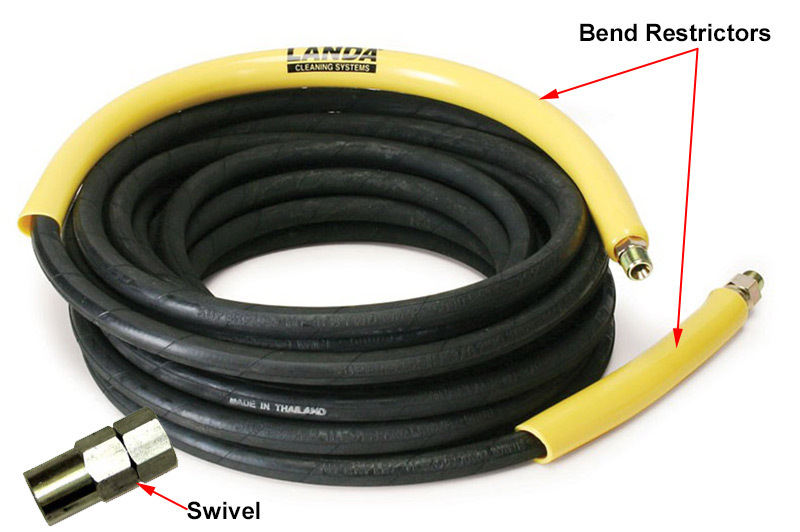 When a hose is flattened in this manner, the wire braid usually gets broken. This may weaken the hose enough to cause a future blowout. The problem with damage resulting from kinking or flattening is that failure does not occur immediately. In fact, damage may not be visible at all. Excessive dragging of the hose will cause abrasion which will erode the cover of the hose down to the wire reinforcement, exposing the reinforcement to rust or deteriorate. Hoses should only be used at their temperature and pressure rating. Excessive temperature can cause the rubber material of the hose to harden and subsequently crack whereas excessive pressure can cause damage to the hose material as well as increase the internal temperature. Damaging pressure buildup can also occur if the spray gun is shut off while the pump is still running. The working temperature and pressure of a pressure washer hose are determined by the materials with which they are constructed and the inner diameter of the hose. Obviously, then a hose can be constructed to meet a variety of temperature and pressure ratings, and, indeed this is why there is such a variety of hoses on the market. To purchase a hose suited for your purpose, you need to know the application, pressure, temperature and kind of machine for which it will be used. Ask you local pressure washer dealer about the best hose for your equipment. As with other pieces of equipment, hoses should be properly cleaned after each use. Because of the pin pricks in the hose cover, the exterior of the hose is particularly vulnerable to solvents. These tiny holes can allow fluid to enter the hose from the outside. Therefore, hoses should never be allowed to sit in pools of liquid, as some solvents can permeate the hose through the pin pricks and degrade the wire reinforcement. Hoses should also be winterized properly. If water is allowed to remain in the hose under freezing conditions, it is likely to expand, causing damage to the tube or reinforcement. In addition, the metal fittings may freeze and be damaged. It should be kept in mind a leak does not always occur at the site of the problem. In fact, a hose may be leaking at a point far away from the source of the trouble. This not only means that a hose problem is that much harder to solve, it also means that a particular problem may be much worse than is first apparent. For example, a pin prick leak may be due to a hole in the tube or it could be caused by a bad fitting. Either way, if the source of the problem cannot be determined and/or solved, the hose should not be used. Storing the hose properly will avoid damage when it is not used. Using a hose reel will keep your hose from being stepped on, driven on, kinked, flattened and other damaging encounters. Hose reels make using your pressure washer faster, easier and safer. Contact Williams Cleaning Systems for any questions about your equipment. Our experienced team members can inspect your equipment for proper specifications and safety.